These Fisher Scientific bins will be placed in UNC Laboratory locations to collect Biologicals Coolers and Gel Packs for reuse. Procurement Services, Office of Waste Reduction and Recycling and Fisher Scientific are excited to begin a new Fisher Scientific Biologicals Cooler and Gel Pack Reuse Program. Fisher Scientific-branded white containers were added this week added to select recycling areas around campus. During the first week in December, Fisher Scientific will start shipping frozen and refrigerated products from the Scientific Stockroom in the reusable coolers. The list of items shipped using the returnable packaging program will be provided to the end users by Fisher’s sales team and includes top selling Invitrogen and Gibco products that have recently been added to the Scientific Stockroom. The items are also called out specifically on the punchout via ePro. There is an emoji/GIF on Fisher’s website that alerts the purchaser that this item is a part of the Scientific Stockroom inventory. Therefore, users will know prior to adding the item to their shopping cart. The Fisher sales team, including other Thermo Fisher Scientific sales representatives, will be out discussing the program on campus; moreover, each returnable cooler will have instructions regarding this program. 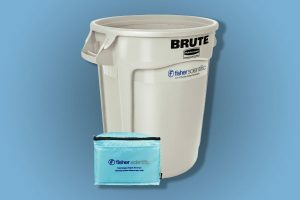 The return process is simple: place the returnable Fisher Biologicals Cooler and gel packs in the Fisher Scientific reuse container located on your floor. PLEASE NOTE: These bins are NOT for Styrofoam recycling. The packaging material will be routinely collected, cleaned and reused to support sustainability on campus. View a complete list of Fisher Scientific Reuse Program recycling sites. Thank you for your support of this initiative to greatly minimize the use of Styrofoam and plastic foam packaging on campus and work toward the Three Zeros Environmental Initiative goal of zero waste. Fisher Scientific’s goal is to reduce the number of plastic foam coolers by 60 percent, eliminating more than 800 Styrofoam coolers from reaching campus.